Padlocks come in many varieties. From the ones you found on your diary as a child. To the ones you find on industrial cruisers for the safe keeping of highly valuable goods. The right padlock of choice for your situation relies entirely on the purpose and mechanism of what it is that you are locking. Here we go through some of the most common types of padlocks available on the market today. We hope you’ll get a better idea to the options out there, and if you have questions on padlocks, locks or if you have other security questions. Please feel free to contact our lovely crew at any time. A closed shackle padlock is a security padlock. Much of the lock loop is enclosed and out of easy cutting range from any tool. They are often heavy duty, and suitable for the locking of units, outdoor and indoor storage, lockers and more. In many cases where insurance is involved. 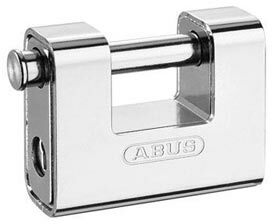 This type of lock is the minimum requirement for what would be considered secure and passable. A straight shackle padlock is much the same as a closed shackle padlock. As the name suggests the loop is here instead in a straight shape and the lock is often a square or rectangle. A discus padlock is a design which is not spring loaded. 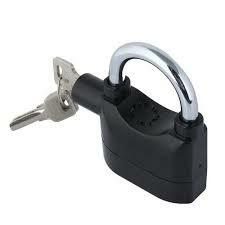 This means that if a drill is used the lock will still remain engaged. These are highly secure, but also difficult to open should there be a lockout situation. Long shackle padlocks provide you with an extended loop of toughened metal and allows flexible locking of a range of things. And combination padlocks are opened with locks. Combination padlocks are often deemed a less secure lock, however this is not true. But they will come in at a higher price. So a regular padlock of the same security calibre as a code lock would be cheaper. Alarmed padlocks are recommended for heightened outdoor security. How secure is a padlock? For your garden areas the security of your padlock is also determined by the surrounding equipment. For secure garden locking it’s best to consult an outdoor security specialist. You can find such a one at our practice. Feel free to call at any time. The level of security and attack resistance that a padlock provides varies depending on the type it is. One way to fairly reliably judge the security that your loop provides. Is by price. The more expensive you go the more likely it is that your lock will be worth the money that you pay for it. It goes without saying, a brass mass produced padlock with a simple mechanism is generally of very poor security and it doesn’t take much for anyone with a little bit of skill and practice to make their way through it. Outdoor areas do best with high security padlocks of a type which makes it difficult to easily cut or pick. In addition to your padlock and the extra long screws and fixings you need for the locking mechanism which the padlock goes in. It’s a great idea to add extra security in the form of other security features. A CCTV camera pointing at your shed, brought to the burglars attention by the light turned on by his movements will no doubt have him running away. At least if he is part of the general statistical curve. The deterring power of CCTV cameras, with good outdoor lights and great padlock choices. Will make your garden and outdoor areas as safe as can be. Leaving your tools and plants in a good and secure place for the night. Each night.